This one has been in my archives for four years already. Finally I feel like sharing it. Per Nørgård – I Ching, mvt. 4 – Towards Completion, Fire over Water. One of the most wonderful works for percussion solo, written back in 1982 for my main teacher Gert Mortensen with his great contribution to the score and instrumentation, and of course to the performing practice of such music. No more words, eventhough the ideas behind the piece are amazing and it’s exciting to explore them. Sound engineer: Franziska Wackerhagen ! Being back in Copenhagen after a few years also means to join my percussion mates there and other graduates, under the name of Percurama Percussion Ensemble yet again! 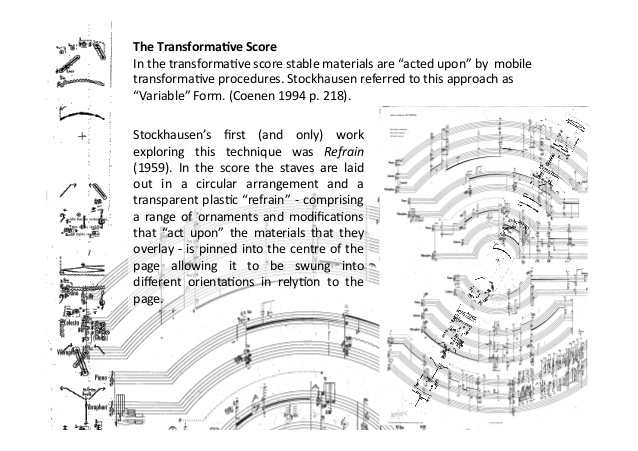 Stockhausen’s music is in the area of my interest for a long time. My practical approach was started by Gert Mortensen who convinced me to work on “Zyklus”. It was on my 2nd Master. Well, “Zyklus” is in my repertoir for over 3 years now and I have performed it frequently for varied audience. There were other pieces by this great genius that I was playing or wanted to play. Eventually, when it came to scetching my Debut Concert’s program, “Zyklus” was there due to many factors. It came naturally, that “Refrain”, a chamber music piece, being very close to the solo Stockhausen’s piece, is the one to be in my program as well. They are very different from each other, but both were composed during the “Kontakte” period in 1959. I am not saying that’s the only reason. “Refrain” is beautiful, and it’s so interesting to play together. With its colours, layers, timing and relationships between three parts it is absolutely marvelous music. It is suspended somewhere beyond reality. And the score…this is something extraordinary to work with. Here I should say, I got an opportunity to work on “Refrain” together with two great pianists. I had a chance to play contemporary music with both of them before, but this time was different. Probably because of special kind of communication that is required, and a very open mind to create all that, what Stockhasuen had put into this masterpiece. Many, many great thanks to Kristoffer Nyholm Hyldig (piano) and Manuel Esperilla (celesta). In many respects, “Refrain” may be considered a female complement to “Zyklus”. They are both composed in the same period, along with “Kontakte”. The title refers to recurrent disturbances that ruffle the ringing tranquility of the chordal music. These are engraved on a transparent strip, which is movable on its axis, so the music can be disturbed at number of places, varying performance. That is left to the musicians to decide. Further principles determine the sound layer of this trio composition. Nearly static chords dissolve into melodies. There is some kind of peace inside this sounding space.